Few other personas within the history of the left have had such a central role in major global solidarity campaigns as Willi Münzenberg (1889–1940) during the interwar period. He was the driving force and organiser of the Youth International that was the largest anti-war organisation during the First World War. He coordinated the international worker’s famine relief to Soviet Russia and, during the early 1920s, he transformed the famine relief campaign into the International Workers’ Relief (Internationale Arbeiterhilfe, IAH). As a film distributor and producer he introduced modern Russian films to Germany and Europe. As a publisher and leader of the Weimar Republic’s most influential left media empire Münzenberg became as a longtime Member of Parliament for the German Communist Party (KPD) a serious adversary to Goebbels and Hugenberg. Further, Münzenberg initiated with the ’League against Imperialism and for National Independence’ a world wide anti-colonial network that was unsurpassed during the interwar period. After 1933 Münzenberg’s name is like no other connected to a number of charismatic, anti-fascist campaigns. In the French exile he fought for the establishment of the German Popular Front, but after the signing of the Hitler-Stalin-Pact Münzenberg became one of the most prominent critics of stalinism when he published his article ”The Traitor, Stalin, is You”. As a last effort, Münzenberg gathered as a publisher – this time independent of the party – a substantial part of the German and European anti-Hitler-opposition to hinder the beginning of the Second World War. In summer 1940, he fled from an internment camp in southern France when the German Wehrmacht invaded France. Months later Münzenberg’s corpse was found – although the cause of death (suicide, Nazi- or Stalinist assassination) has remained unresolved. Global thinking, networking and above-party, internationalist action in social movements characterised the political lifework of Münzenberg: At the First European Will-Münzenberg-Conference (2012) Münzenberg was highlighted as a paradigmatic figure, whose history enables the (re)writing of a workers’ movement between social democratic reformism and stalinist orthodoxy. The fragmented ”legacy” of Münzenberg is in need of a re-evaluation on the basis of transnational perspectives. Moreover, after a quarter of a century since the ”Archive Revolution” the time has come to summarise the historiography in both East and West. It is therefore timely to call to the First International Willi-Münzenberg-Congress, organised between 17 and 20 September 2015 in Berlin. The congress aims to present and analyse actors, forms and practices of global solidarity networks in the context of social, cultural and humanitarian movements of the 20th Century. Among others, the congress will look at collective biographies and the imagining of a ’cultural international’, the role of media and aesthetic mediums; questions that already during the interwar period were expressed in the Solidarity Song (Solidaritätslied) by Brecht and Eisler: ”Whose tomorrow is tomorrow, whose world is the world?” („Wessen Morgen ist der Morgen, wessen Welt ist die Welt?“). 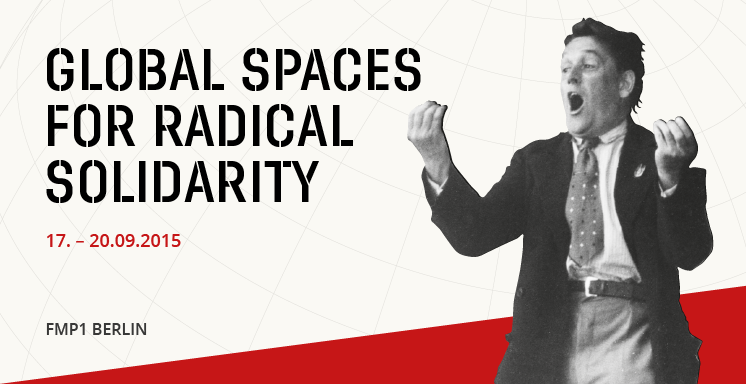 Through a number of case studies the congress probes into the ideological and conceptual shifts between revolutionary internationalism, anti-fascism and anti-stalinism during the 1930s. Further focus is set on the history of anti-colonial movements in Asia, Africa and Latin America, as well as the network around Münzenberg’s last publishing venture, Die Zukunft (the Future). Between 1938 and 1940 he stood for a new liberal-socialist Germany and for a united Europe based on a new ”German-French Union”. Like so many others ideas, these were often barely taken into consideration after 1945. However, there were a number of effects, turning points and continuities in transnational solidarity networks that found a continuation throughout the 20th century: in the cultural history of the Federal Republic of Germany, in Third World solidarity movements, but also in Latin American liberation struggles and in the actions of NGOs until the 21st Century. The congress organising committee is formed by Bernhard H. Bayerlein, Uwe Sonnenberg and Kasper Braskén. We thank for the kind support of MediaService GmbH Druck und Kommunikation, the internet agency Keksbox, the newpaper neues deutschland, Åbo Akademi University, Åbo (Turku); Arbejdermuseet, Kopenhagen; Institut for Social Movements, Ruhr-Universität Bochum; Maison des Sciences de l’homme, Université de Bourgogne, Dijon; Schweizerisches Sozialarchiv, Zürich; Zentrum für Zeithistorische Forschung, Potsdam. Ksenija Vidmar Horvat and Avgust Lešnik (Ljubljana): Forms of Solidarity: Female volunteers in the Spanish Civil War. An unique spectacle in the tradition of Piscators Revue of the early 20th. With Kurt Tucholsky, Lea Streisand, Sebastian Lehmann, John Heartfield, Maik Martschinkowsky, Leo Lania, Sulaiman Masomi, Slatan Dudow, die Rixdorfer Perlen, Hans Eisler, Vivian Kanner and many more.